Electric vehicles and offshore wind emerge as bright spots in a slower global investment quarter, according to new figures from Bloomberg NEF. Three Chinese EV firms alone raised a total of $1.9 billion last quarter. China’s electric vehicle boom is attracting a massive amount money. Three Chinese EV firms alone raised a total of $1.9 billion from public market, venture capital and private equity investors during the third quarter of 2018. Nio's public offering brought in $1 billion, Guangzhou Xiaopeng Motors raised a $585 million Series C venture capital round, and Zhejiang Dianka Automobile raised a $294 million pre-IPO round. Equity raising by specialist electric vehicle companies emerged as a bright spot in clean energy investment totals for last quarter, as more traditional investments slipped, according to the latest figures from Bloomberg New Energy Finance. China currently has 487 domestic EV makers, according to the The Wall Street Journal. President Xi Jinping’s Made in China 2025 plan, launched to promote “domestic dominance and global competitiveness” in key 10 sectors, is giving a boost to EV startups. 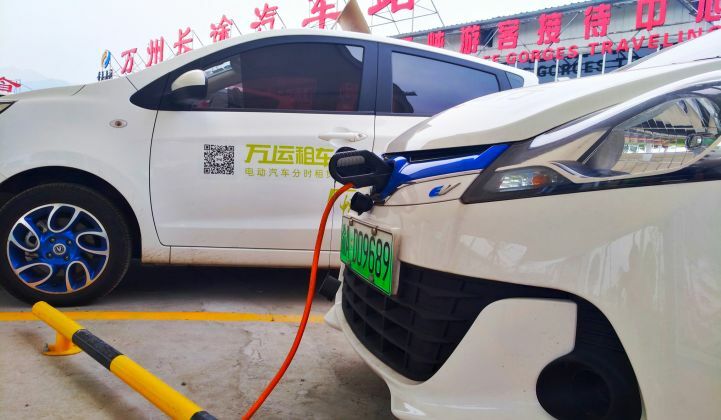 In June, the National Development and Reform Commission and China Construction Bank launched a $47 billion fund for emerging technology, including new energy vehicles. That's just one example of the growing momentum around EV growth in the country. Despite that growth, global investments in EVs and clean transportation pale in comparison to funding levels for wind and solar. 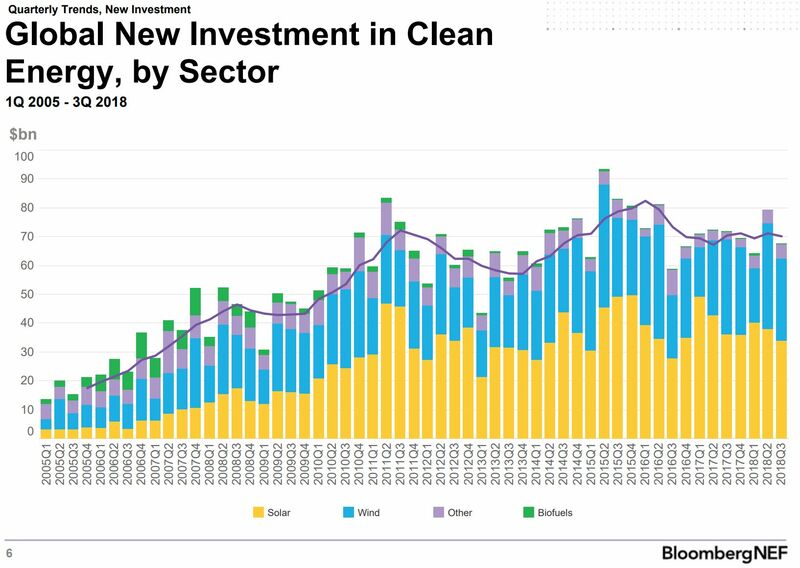 Third-quarter figures from BNEF show wind and solar continuing to dominate the clean energy market. Funding for utility-scale renewable energy projects came to $49.3 billion last quarter, down 15 percent from Q3 2017. The purchase of small-scale solar systems under 1 megawatt saw an uptick, however, bringing in $13.5 billion, up 9 percent on a year earlier. Overall, global clean energy investment in the third quarter of 2018 came to $67.8 billion, down 6 percent from the same period last year. Solar investment in China slipped in Q3 as the country adjusted to the government’s new solar guidance. On the positive end, financings for offshore wind projects were a significant contributor to investments in the quarter, in addition to equity raising by EV companies. The $2.6 billion Triton Knoll offshore wind farm, the $1.4 billion sale of Enel’s South Africa wind portfolio and the estimated $1.2 billion Guohua Dongtai offshore wind farm in China were three biggest renewable energy asset financings of the quarter. Total clean energy investment year-to-date stands at $211.4 billion — 2 percent below the first nine months of 2017. According to BNEF, that leaves open the possibility that 2018 will end up on par with last year’s total, particularly if a few more multibillion-dollar offshore wind deals get done before the end of the year. It's worth noting that as technology costs decline, investment numbers could sink while project sizes continue to grow. Still, investment levels serve as valuable method for tracking clean energy progress. The United Nations' climate science report released this week calls for $2.4 trillion in clean energy investments each year through 2035 in order to mitigate the worst impacts of climate change.